ScreenSteps Live takes a different approach to collaboration than ScreenSteps Workgroup. 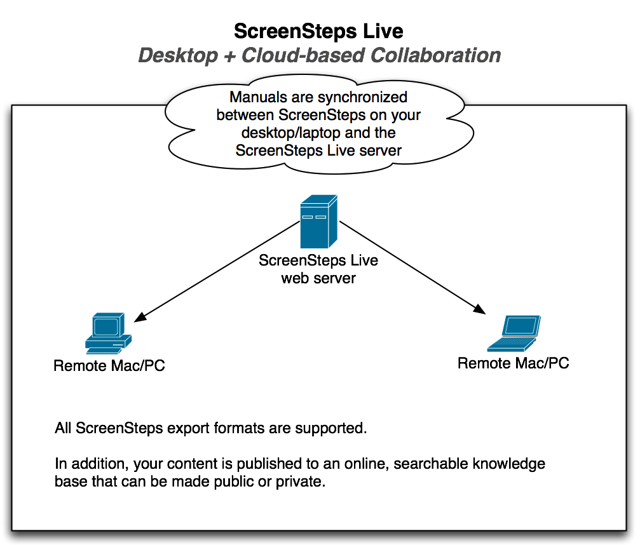 ScreenSteps Live combines the ScreenSteps Desktop software with a cloud-based solution. All authoring is still done in the ScreenSteps Desktop software but the content is published to the ScreenSteps Live servers. ScreenSteps Live works by synchronizing the source content of your manuals between different authors and storing that source material in the cloud. ScreenSteps Live also stores all of the source material for the lessons that are created. This means that any author can go back at any time and edit the original image files, replace screenshots or make any other necessary changes. One. if they need to create an online knowledge base they will have multiple authors create lessons and add them to a manual. As they publish this information an online knowledge base is automatically created that they can make available to their customers or employees. Others who don’t need an online knowledge base will use ScreenSteps Live to collaborate on their manual. When the manual is ready for publication one of the authors downloads the finalized manual to their desktop software. From there they can export to any of our supported formats, including PDF, Word, HTML or many blog and wiki formats. ScreenSteps licensing works on a per-author basis. You pay a monthly subscription for the number of authors on your account. But we like to keep things flexible so we allow you to activate and deactivate authors. Deactivated authors don’t count agains your total number of users. This allows you to bring in people to work on a documentation project or awhile and then turn their accounts off when they are no longer needed. If they need to start documenting again you can reactivate their accounts. Larger organizations who plan on having 15 or more users with some who will be documenting regularly and other who only need to create documents infrequently can contact us. We can usually work out a subscription price that will meet your specific situation. You can sign up for a free 14-trial of ScreenSteps Live at the ScreenSteps Live website.